I bought a new cookbook a few months ago, but haven’t had the chance to do anything with it (aside from reading and drooling) because of the kitchen remodel. My favorite cuisine: Middle Eastern. Thanks here to my brother and his family, because while waiting to meet Lori in downtown Santa Rosa, we all went into the Barnes & Noble bookstore. I wouldn’t have found the cookbook (Jerusalem: A Cookbook, by Yotam Ottolenghi and Sami Tamimi) without the old-school wander through the aisles. 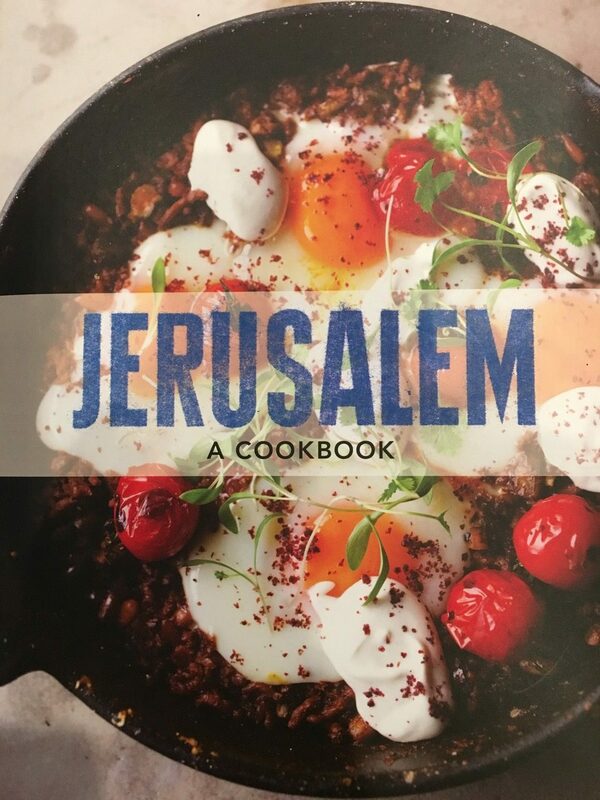 Jerusalem: A Cookbook, by Yotam Ottolenghi and Sami Tamimi, showing the Braised Eggs and Lamb on the cover. But the kitchen is done now, so no more excuses. And friends were going to come over for dinner, and cousin Diego was in town. 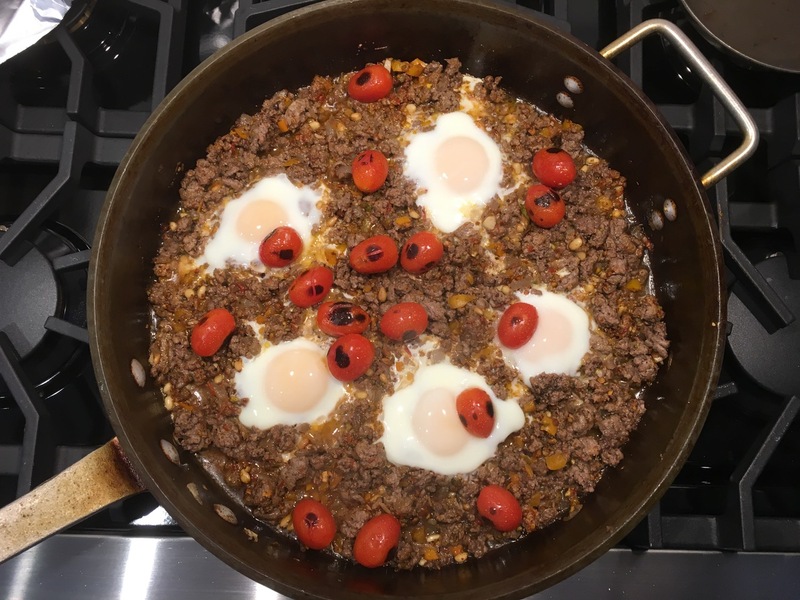 We cooked up the recipe shown on the cover of the cookbook, Braised Eggs with Lamb. At least we got it looking pretty close to the cookbook picture! Actually it tasted pretty darn good. This is the sort of recipe that I really like making. Essentially a one pot meal, nothing especially fancy about it, just good ingredients and flavorful spices. Cumin, sumac, pine nuts and pistachios are the flavor anchors for this dish. Braised Eggs and Lamb on our stove. With the lamb and the unique flavors, we needed a special wine to go with this. 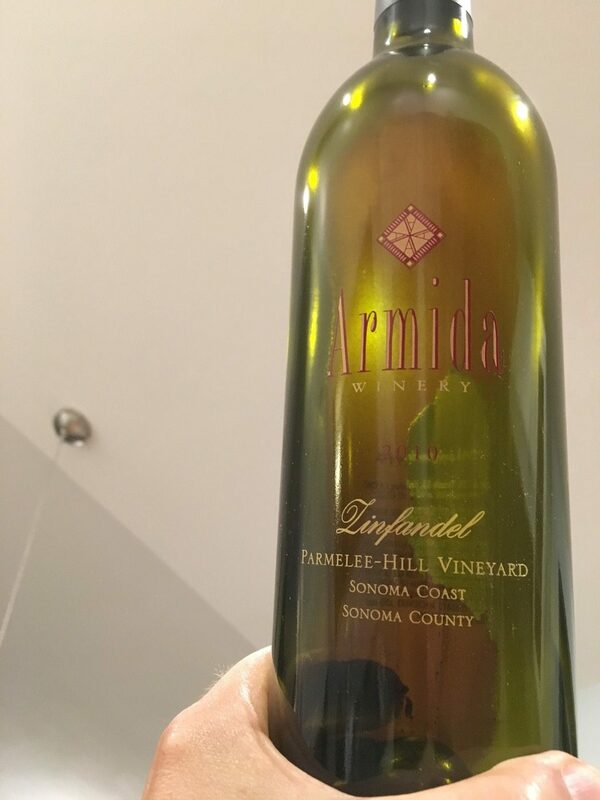 We pulled out a 2010 Armida Winery Zinfandel, Sonoma Coast, Parmelee-Hill Vineyard. This vineyard is nearer to the cool Carneros region than to the warm Dry Creek Valley, where Armida and so many other wineries get so much Zinfandel. As a cool climate Zinfandel, it’s got different characteristics than a typical Zin; less fruit forward, a bit more body, more layers to the flavors. This sort of Zinfandel ages well, and at 8 years this wine is just hitting peak. The subtleties of the wine matched well the complexities of the flavors in the lamb dish. An excellent pairing. 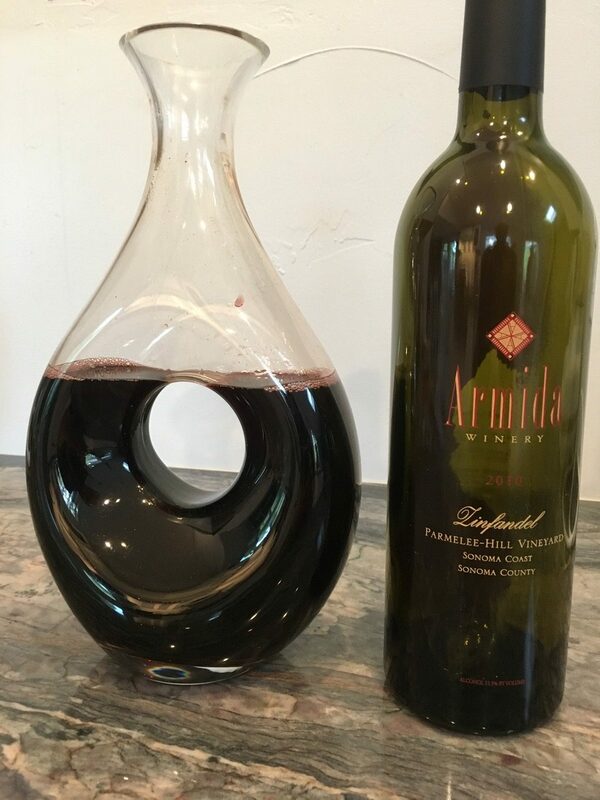 2010 Armida Zinfandel, Sonoma Coast, Parmelee-Hill Vineyard. We decided ahead of time to decant the wine. Also, I had stood the wine up for about 24 hours ahead of decanting, to allow sediment to go to the bottom of the bottle. We did this based on experience with older Zinfandels, and for show (always nice to serve from a decanter). As we saw when we finished decanting, the bottle did have some sediment left in it. If you look carefully behind the Armida label you can see the sediment left behind in the bottle. Lamb and Zinfandel: always a good combination. This entry was posted in food and wine and tagged Armida Winery, Lamb, Sonoma Coast, zinfandel on August 6, 2018 by vvblogman.